Time went by so quickly while at FFFWeek that I didn’t get a chance to wear all of my carefully selected ensembles during my visit. That’s why I’m giving you one more that was supposed to make it’s appearance in the big city, lol. I had been drooling over this black and white bias dress from Ashley Stewart, $49.50 ever since it popped up on their site earlier this season. But at that time it was a web-exclusive and I missed my chance because my size sold-out quickly. Well now it’s available in stores so I grabbed it when I saw it last week. 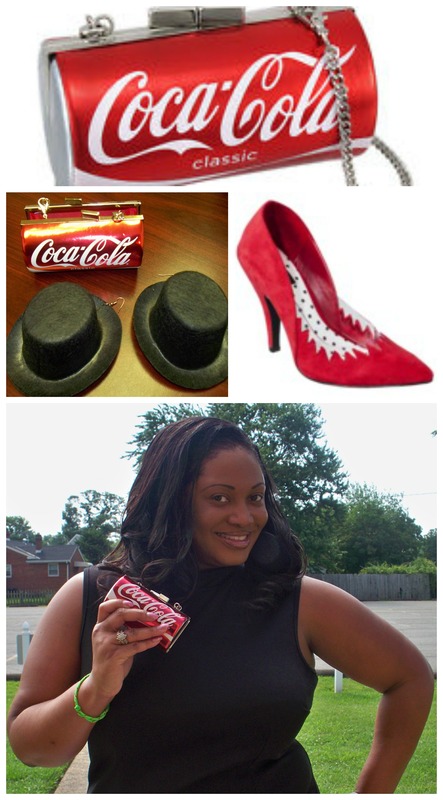 I hate to use the same ole red, white and black color theme to the ever popular monochromatic look but this new Coca-Cola clutch that I got left me no choice. I found this goodie in the actual shape and size of the soda can for only $20 while perusing on Ebay one night. Once I ordered the bag I knew that I had to base an entire outfit around it since it was so adorable. The clutch has a chain strap so you can either wear it by hand or on your shoulder. If you look very closely you’ll see that my earrings are replica top hats. They were hand made for me by designer Kourtney Hankins before she moved to Milan. I only paid $20 too, what a deal for such exquisiteness. I figured a red pump would be sufficient and since I finally added a pair to my wardrobe, I rocked these Suede Kate Young Pumps for Target, Now $34.